If you haven’t been to Newberg lately, you are truly missing out. Not only has it become a quaint little town with incredible food, wine, beer, shopping and cultural options, the people are absolutely lovely. Spending a day basking in the rich variety that the area has to offer is like eating your grandma’s delicious apple pie made with her special brand of love and perfection. It will leave you with so many warm fuzzies, you’ll be smiling about it for days. Since we really want the best for all of you, warm fuzzies and big smiles included, we compiled a list of some of our favorites (links included). Please, enjoy! Food and Drinks: Food,wine and beer have become a pretty big deal for our little area and for good reason! If you haven’t been out to sample some of the goods, you should cancel all your weekend plans and run to nearest winery/brewery/restaurant. You can thank us later. One of our favorite things to do with friends and family when they come to the area is to take them out to share an amazing meal and have a culinary experience that is unique to our valley. We have an abundant amount of great places to taste wine and brews; pair that with the outstanding restaurants and small local eateries for some decadent nibbles and elegant meals you and your guests will never forget. Maybe you are more into beer or interested in trying both. We don’t judge. Local breweries are popping up all over the place. Some of our favorites are Chehalem Valley Brewing Company, Golden Valley Brewery, Fire Mountain, Long Brewery, Deception Brewery. Get more info on these hop enriched delights here. After all that drinking, you’ll surly need something to eat. Just as with wineries and breweries, the options for filling your tummy are endless. If you prefer to dine in, try: Jory, Subterra, Recipe, Red hills Market, Ruddick & Wood, Storrs Smokehouse, Tinas, Joel Palmer House Find our extended list with links and brief descriptions in a previous post here. Pampered & Leisure: All that running around eating and drinking can wear a person out. Whew! 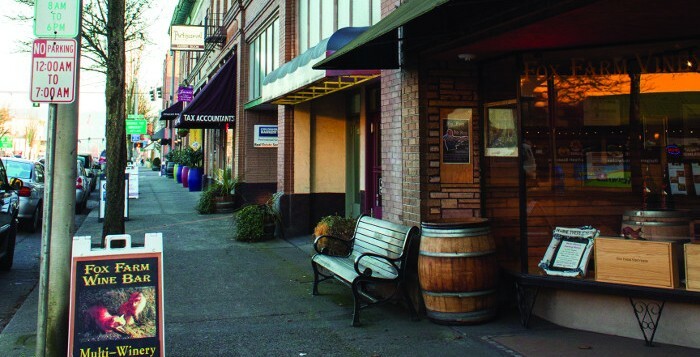 Sit back, relax or take a little stroll and enjoy some of the finer ways to feel pampered during your leisure time in Newberg. Massage/Spa/Facial: Allison Inn & Spa, Ultimate Tan & Med Spa, Mode du Jour, Spa Bliss, Abba Day Spa, Luminous Boutique Spa (they can even give personal references for in house massage therapists). Action & Adventure: If you prefer spending your down time exploring the land, sky and water through more adrenaline filled activities we’ve got you covered there too. Culture: Learning something new or just taking a leisurely stroll through town is a great way to spend a beautiful afternoon. Newberg is full of opportunities to get your mind and your feet moving. Our wish for you today is to try out one new local treasure or get crazy and try them all! Supporting these local businesses enriches our community and makes it a better place to live. If you are just visiting the area, we say, “Welcome!”, “Enjoy!” and “Thank you for visiting our beloved home”.